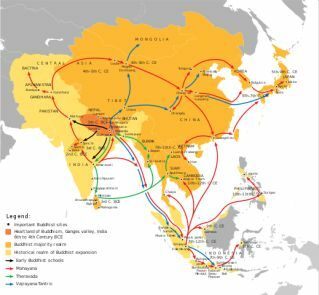 The Buddhist Theravada remained as a line after the secession of the Mahayana at the second Buddhist Council. It is today the Buddhist religion prevalent in Burma (Myanmar) and Thailand, but is also common in Sri Lanka, Cambodia, Laos and Vietnam. It comes from the lineage of tradition of the bhikkshuni ordination and claims to transmit the original teachings of the Buddha (Theravāda: Teaching of the elderly of the orders), A claim to that already regarding to the twisted contents of the Tipitaka considerable doubts exist. The many tantric Bodhisattvas are unknown here, just as the meditations differ completely from the practices of the Mahayana and of the tibetan tantra. In the first Theravada Council of 1788 in Bangkok the Pali texts as the first complete print edition in Thai script in 39 volumes came into beeing. The many Buddhas and Bodhisattvas of Mahayana are regarded as apocryphal. A summary from the point of view of Theravada are the 37 necessary things for enlightenment as enumerated in the Mahāsakuludāyi - Sutta. The multitude of Bodhisattvas and Buddhas as in Mahayana and in Vajrayana is here unknown. 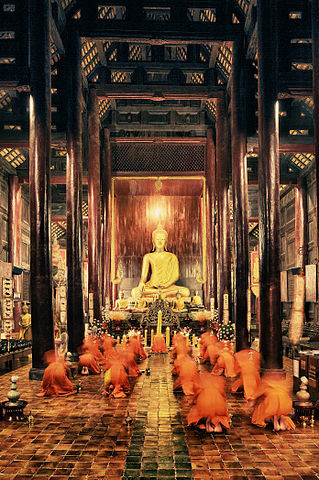 The Abhidhamma is here often looked at as a teaching which the buddha spread 40 days after his enlightenment. The Sarvāstivāda Abhidharma postulated that the Buddha's body born from his mother (janmakāya) was a retributed body (vipaka-kaya) and subject to impurities, passion and pain. The buddha had another body which he can manifest at will (nirmana kaya) and a dharmakaya-body which consisted of pure dharmas. Also a manomaya kāya is known, which was sometimes interpreted as the enlightenment body of a buddha. The esoteric bodies of the yogasystems are here not defined. The dharmakaya-body in the Mahayana-trikaya was a bit different, and the Tathagatas body was looked at as undestructable, infinite, pure, formless and free of sensations. The cosmology of the Theravada describes 31 planes in which the rebirth takes place. The order of the plains is enumerated in various parts of the Sutta Pitaka (for example, in Saleyyaka Sutta of Majjhima Nikaya, Anguttara Nikaya, Samyutta Nikaya, Digha Nikaya, Khuddaka Nikaya). In various sutras of Anguttara Nikaya, the Buddha describes the reasons for the rebirth in these planes. Rūpaloka: World of form, quite free from low desires and populated by Jhana gods. Reincarnation place for advanced practitioners in janish or meditative absorption. In addition to the realization of the doctrine, the Vipassanā meditation and the Samatha  are part of the practice. In addition, breath-meditations are common. An essental practice is also the Jhana - Meditation.